Never had I ever roasted strawberries. My whole kitchen smelled like…butter. Not fruit. Butter. Like I had just baked a rather large batch of buttery donuts. But I hadn’t! I don’t know why or how roasted strawbs make you feel like you’re going to open the oven and find that they’ve transformed into a buttery baked good, but they most certainly do. They evoke feelings of fried dough. I have so many feelings about the aroma of roasted strawberries!!! They got all soft and sweet and ooey gooey melt in your mouth good. Folding them into the batter was cathartic. The pink swirls dotted with mini chocolate chips…I just couldn’t. I still can’t! 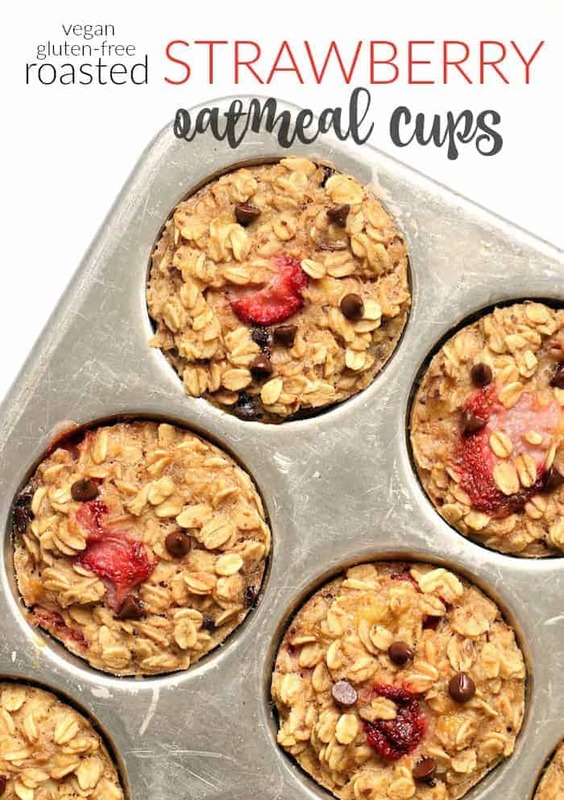 In case you haven’t noticed, baked oatmeal cups have become a food group. It started last year with Banana Zucchini, which turned into Lemon Coconut, then Chocolate Peanut Butter. They’re my snack of choice pretty much always. Now that I know the recipe by heart, we make them every week with different variations. Sometimes we throw in a scoop of protein, a handful of blueberries, walnuts, jelly swirls, whatever really. They’re impossible to mess up! If you don’t want your kitchen to smell like dreamy strawberry butter and have fun little roasted strawberry jewels peaking out of your baked oatmeal cups, feel free to skip the roasting step. It’s not necessary, but it sure is beautiful! 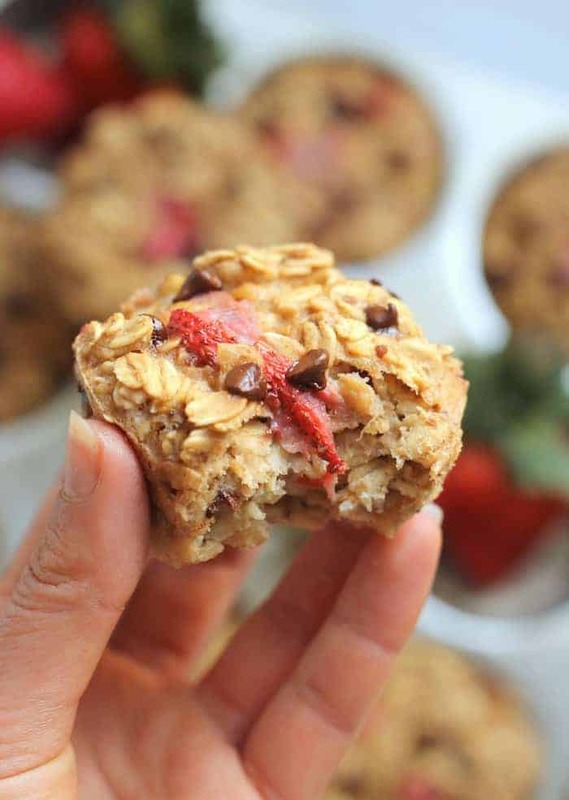 All you need is one bowl, some ripe nanners, fresh strawbs, hearty whole grain oats, and a handful of ingredients you likely already have on hand to whip up these oil-free, gluten-free, whole grain beauties. If you’re not vegan, you can use an egg in place of the flax mixture. Any milk and any nut butter will work great. I sweeten them with stevia, but honey, agave, and maple syrup will all work just fine if you want them a bit sweeter. And I mean hey…if you want to double/triple/quadruple the chocolate chips, you have my blessing. 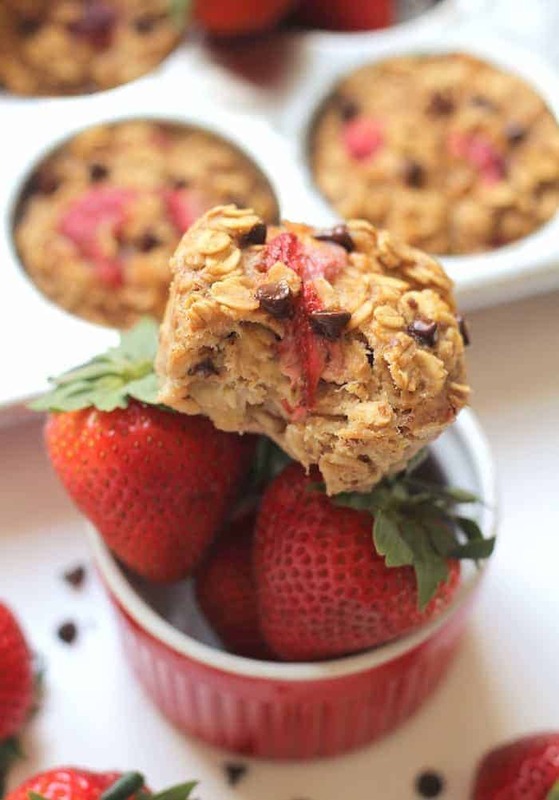 These lightly sweetened, gluten-free, oil-free, whole-grain banana baked oatmeal cups with juicy roasted strawberries and melty chocolate chips make the perfect afternoon snack or breakfast on-the-go. 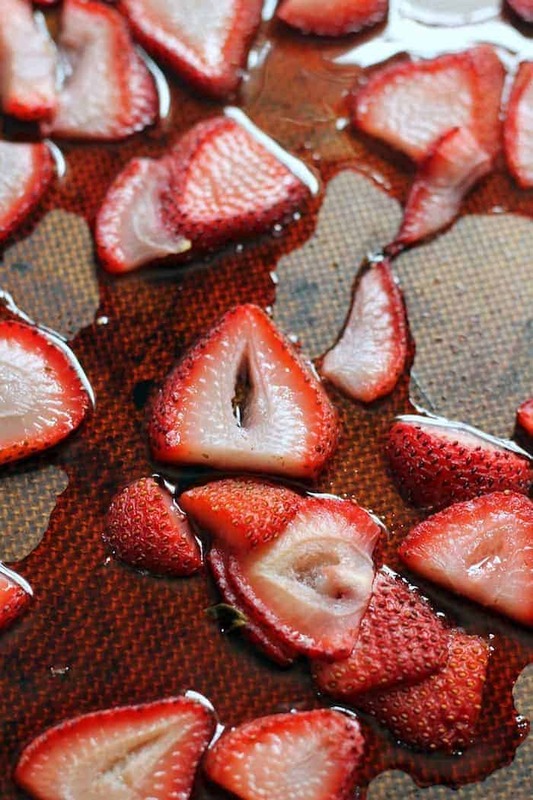 Place strawberries on a lined baking sheet. Roast for 25 minutes. Remove and set aside. (You can also skip this step and use fresh strawberries). Place bananas in a large bowl and mash with a fork. Add almond butter, almond milk, optional maple syrup, vanilla extract, and flax mixture, stirring to combine. Add oats, baking powder, cinnamon, and salt. Stir until just combined. 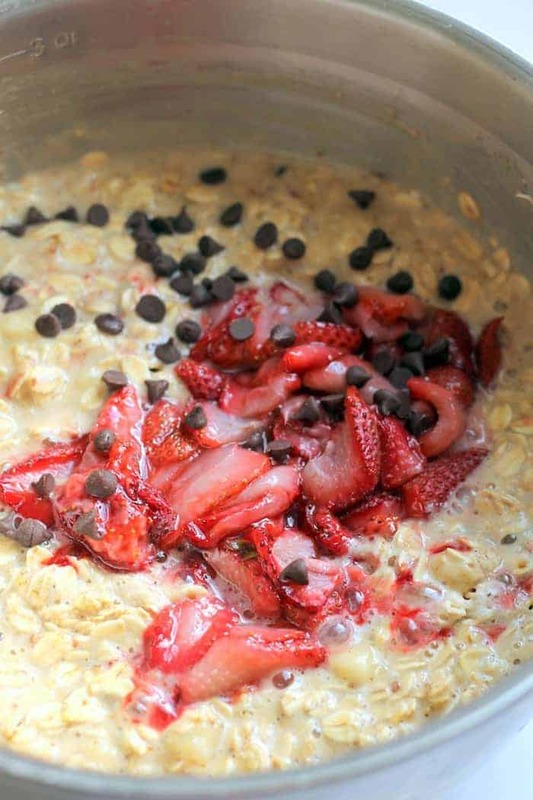 Fold in roasted strawberries and chocolate chips. Spoon mixture into sprayed muffin cups, filling to the top. Do not press down. (You will have leftover batter to make more muffins or make a mini oatmeal bake!) Top each one with a few chocolate chips. Bake for 25 minutes. Cool on a cooling rack. Store cooled oatmeal cups in an air-tight container in the refrigerator. These freeze well, too! Nutrition information calculated without maple syrup. Also, I need to get down to Columbus ASAP! I have been craving Alchemy, and your smoothie bowl/toast instagram posts have been making me salivate just looking at them! I’ve never roasted strawberries either but this definitely makes me to try it… I agree you can’t go wrong with baked oatmeal of any kind though! these look great – i have never heard of or thought of roasting strawberries – yum! I have a random question…when you make a smoothie/bowl..how many ounces does it end up being? I haven’t tried roasted fruit yet but have seen it. Need to get on this bandwagon!! Doooood roasting strawbs is da best! Roasted strawberry nice cream=all the heart eyes. any substitution ideas for the bananas? I, too, am allergic to them and they seem to be in many baked goods. Applesauce! You may need to add more sweetener to the batter. How much applesauce would you use in this recipe to replace the bananas?